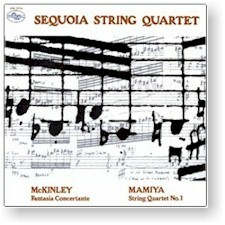 Winners of the prestigious Naumberg Chamber Music Award and recognized as one of the world's premier string quartets, the Sequoia Quartet offers stunning performances here of two highly dramatic contemporary works: William Thomas McKinley's Fantasia Concertante and Michio Mamiya's String Quartet No. 1. "Splashingly colorful and entertaining." Recorded on (A) 13 September 1977 and (B) 12 February 1978 at United-Western Studios in Hollywood, California.